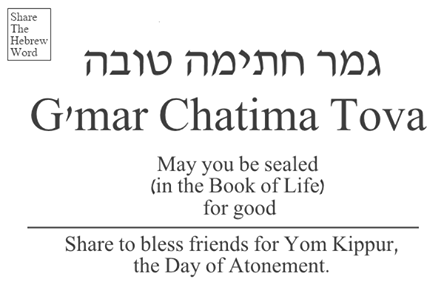 Chag Sameach Mispacha in the Emunah! May your feast be one of repentance, forgiveness and restoration. Servants of Yahshua ha Mashiach!!! Chag Sameach Teruah! Happy Feast of Blowing of Trumpets. Lev 23:24 “Speak to the children of Yisraʼĕl, saying, ‘In the seventh month, on the first day of the month, you have a rest, a remembrance of blowing of trumpets, a set-apart gathering. Rev 8:2 And I saw the seven messengers who stand before Elohim, and to them were given seven trumpets. Rev 8:3 And another messenger came and stood at the altar, holding a golden censer, and much incense was given to him, that he should offer it with the prayers of all the set-apart ones upon the golden altar which was before the throne. Rev 8:4 And the smoke of the incense, with the prayers of the set-apart ones, went up before Elohim from the hand of the messenger. Rev 8:5 And the messenger took the censer, and filled it with fire from the altar, and threw it to the earth. And there were noises, and thunders, and lightnings, and an earthquake. Rev 8:6 And the seven messengers who held the seven trumpets prepared themselves to sound. Rev 8:7 And the first messenger sounded, and there came to be hail and fire mixed with blood, and they were thrown to the earth. And a third of the trees were burned up, and all green grass was burned up. Rev 8:11 and the name of the star is called Wormwood. And a third of the waters became wormwood, and many men died from the waters, because they were made bitter. Rev 8:12 And the fourth messenger sounded, and a third of the sun was struck, and a third of the moon, and a third of the stars, so that a third of them were darkened. And a third of the day did not shine, and likewise the night. Rev 9:6 And in those days men shall seek death and shall not find it. And they shall long to die, but death shall flee from them. Rev 9:7 And the locusts looked like horses prepared for battle, and on their heads were crowns like gold, and their faces were like the faces of men. Rev 9:8 And they had hair like womenʼs hair, and their teeth were like lionsʼ teeth. Rev 9:9 And they had breastplates like breastplates of iron, and the sound of their wings was like the sound of chariots of many horses running into battle. Rev 9:10 And they have tails like scorpions, and stings. And in their tails is their authority to harm men five months. Rev 9:11 And they have over them a sovereign, the messenger of the pit of the deep, whose name in Heḇrew is Abaddon, but in Greek he has the name Apolluon. Rev 9:12 The first woe is past. See, two woes are still coming after this. Rev 9:15 And the four messengers, those having been prepared for the hour and day and month and year, were released to kill a third of mankind. Rev 9:16 And the number of the armies of the horsemen was two hundred million, and I heard the number of them. Rev 9:17 And this is how I saw the horses in the vision and those who sat on them, having breastplates of fiery red, and hyacinth blue, and sulphur yellow. And the heads of the horses were like the heads of lions, and out of their mouths came fire, and smoke, and sulphur. Rev 9:18 A third of mankind was killed by these three plagues, by the fire and the smoke and the sulphur which came out of their mouths. Rev 9:19 For the authority of the horses is in their mouth and in their tails, for their tails are like serpents, having heads. And with them they do harm. Rev 9:20 And the rest of mankind, who were not killed by these plagues, did not repent of the works of their hands, that they should not worship the demons, and idols of gold, and of silver, and of brass, and of stone, and of wood, which are neither able to see, nor to hear, nor to walk. Rev 9:21 And they did not repent of their murders, nor of their drug sorceries, nor of their whoring, nor of their thefts. No matter where you are the King has an appointed time with His servants. His Bride is preparing and the sound of the Trumpet anounces His coming to gather His wise virgins. May our lamps be full of oil. May be be as a perfrect living sacrifice to our Beloved. YHWH bless you and keep you. Y'shua is coming!! Blow the Trumpet! Both sides of the mountain we live heard the Shofar sound today here in South Costa Rica. Mar 13:32 But concerning that day and the hour, no one knows, not the angels, those in Heaven, nor the Son, except the Father. Watch! Be wakeful, and pray. For you do not know when the time is. Are you ready? Early Chag Sameach! UPDATE! OUR FAMILY MADE AN ARTICLE FOR MESSIAH TO THE NATIONS PLEASE DOWNLOAD THE PDF HERE. The Fall Feasts are approaching and we have been busy all year preparing, working, planting, sowing, etc.. We may have loss sense on time as another cycle comes around. Time is flying and it seems like the days have gone and we are stuck thinking, "What about us?". "Why are we here? ", "How much did we grow or fall this year?" Homeschooling, work, leisure, worries can take our focus from remaining clean.These are His Moedim, His Appointed Times to come back to balance and refocus our relationship with Abba YHWH. Times of Awareness in Yom Teruah (Feast of Trumpets) The Bridegroom is Coming!! Then it is the Appointment of Cleansing in Yom Kippur (Feast of Atonement) and them the Season of our Joy, the Rehearsal of the Wedding of the Lamb in Sukkot (Feast of Tabernacles). It might seem like it is hard to do but if we love Him and Keep His commandments He will send us a Helper, the Ruach Emet. Not to be saved but because we will be saved. Yeshua came but has not Returned. “If you love Me, you shall guard My commands(Torah). because it does not see Him or know Him. But you know Him, for He stays with you and shall be in you. Then we seek YHWH and say daddy, "What have I done wrong?, please forgive me." This we want to focus on and a point of view in the video below. before My eyes. Stop doing evil! “Learn to do good! Seek right-ruling, reprove the oppressor, defend the fatherless, plead for the widow. they shall be as white as snow; though they are red like crimson, they shall be as wool. you shall be devoured by the sword,” for the mouth of יהוה has spoken. A time in the year called "MOED" or "Appointed Time" is like a "Date"
He has given us instructions and a set of "Moedim" or "Appointed Times"
work on that same day, that being I shall destroy from the midst of his people. “You do no work – a law forever throughout your generations in all your dwellings. ‘It is a Sabbath of rest to you, and you shall afflict your beings. This day set before we were born for a yearly cleansing. Remember the Wedding of the Lamb? Well we must have our garments ready. clean and bright, for the fine linen is the righteousnesses of the set-apart ones. See soon and very soon we are going to see our King, our Savior. He will purify us with fire. He wants us clean and free from impurities. He wants us to Teshuvah/Repent before the actual Trumpet sounds because He loves us and desires us to walk with Him. But He is a Jealous Elohim and shares His glory with no other. He is all love and also consuming fire. He is a Righteous Judge. Are we wise enough to get ready? Not just the Lamp (Torah) but the Oil (Ruach) and the garments (righteousness-good deeds-right actions). Can we say early Chag Sameach Yisra'EL! We have so much to do and so little time. Let's get ready. not having spot or wrinkle or any of this sort, but that it might be set-apart and blameless.